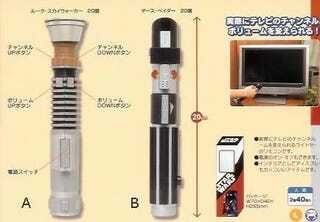 This Lightsaber universal remote is just the thing to have when the Star Wars episodic TV show heads our way in 2009. Featuring five buttons—volume and channel up/down and a gigantic power switch—this 20cm-long remote will make you feel like you're Alec Guinness or Liam Neeson slumming for cash. And when the show turns out to stink as much as the last three movies did, well, you'll be able to switch over to House while making noises with your mouth.